Some recent studies have found that cardio exercise and strength training don’t interfere with one another when the cardio is relatively light (for example, a half-hour exercise bike workout rather than a long run). However, other research suggests that you’ll see more significant gains in whichever activity you prioritize. If you want to work on both types of fitness, you’ll get the best results by doing hard cardio only on certain days and strength training on its own or combined with a light cardio workout on other days. Cardio exercise burns more fuel, so doing an intense cardio workout first depletes glycogen stores, leaving little energy to strength train effectively. To build strength, you need to lift weights heavy enough that you couldn’t do more than 8-12 repetitions per set even if you hadn’t done any other exercise beforehand. If you tire yourself out with cardio to the point where you can’t lift heavy enough weights, the benefits of your strength training will be limited. On the other hand, you’ll get plenty of health benefits even from relatively light cardio exercise, so unless your goal is training for marathons, bike races, or other cardio-focused events, you’re better off prioritizing strength training if you do both on the same days. You’re more likely to injure yourself if you lift weights after cardio, because the likelihood of using poor form increases when you’re tired. Doing strength training before cardio is more effective for replacing fat with lean muscle. Keep it light on strength training days (30 minutes or less of light cardio is unlikely to diminish strength performance). Save your big cardio workouts for non-strength-training days. 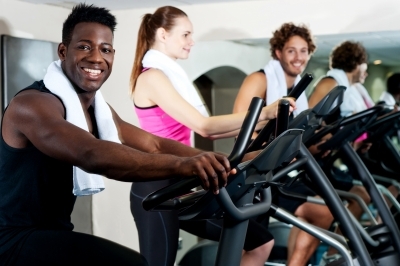 Choose a type of cardio that is less likely to affect your strength (for example, warming up on an exercise bike rather than going for a run). If you do a split strength training routine, do cardio first on days you work only your upper body. Most types of cardio exercise will reduce lower body strength, but not upper body strength (unless you work out so hard that you’re too tired to lift heavy enough weights). Studies have focused on different populations in terms of age, genetics, fitness, strength training experience, and other factors, and different bodies respond differently to the same workout routines, so there is no routine that will be perfect for everyone. Although you can probably combine weights and cardio on the same days, you may need to experiment with different durations and intensities to develop a program suited to your personal goals and physiology. For more strength training articles, see the main Strength Training page. For a full list of fitness articles, see the main Fitness page. Hoffman, A. (2016). Do Cardio and Strength Training Actually Work Against Each Other? International Sports Sciences Association. Ross, J. (2015). Which should come first: cardio or strength training? American Council on Exercise. Weil, A., MD. (2012). Combining aerobics with strength training? Wilson, J. M., Marin, P. J., Rhea, M. R., Wilson, S. M., Loenneke, J. P., & Anderson, J. C. (2012). Concurrent training: A meta-analysis examining interference of aerobic and resistance exercises. Journal of Strength and Conditioning Research, 26(8), 2293-2307.